Since 1969, retroreflectors on the Moon have been measuring the distance from Earth with increasing precision. Lunar reflectors left by Apollo astronauts have been used continuously since 1969 to study the earth-moon system and test the validity of the laws of physics. 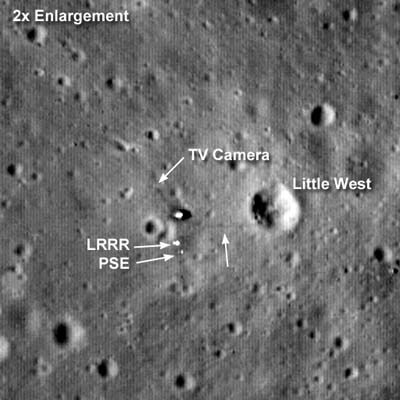 Five "corner mirrors" or "retro-reflector arrays" were taken to the moon in 1969 and the early 1970s (Figures 1 and 2). Corner mirrors are important scientific instruments because, when struck precisely by a laser beam, they reflect the beam in a parallel path back to the source of the laser. 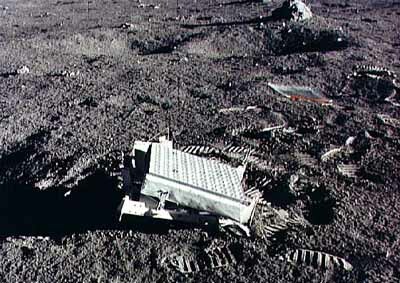 The arrays left on the moon were used continuously in the lunar laser ranging, or LLR experiment. Figure 1. Laser Ranging Retroreflector Experiment (LRRR), part of the ALSEP (Apollo Lunar Surface Experiment Package), left by Apollo 15. Photo: NASA. Some calculations using this data, such as the distance between the earth and moon, are straightforward. The average distance from the centers of the earth and the moon is 238,897 miles (384,467 km) -- measured with a precision equivalent to determining the distance between Los Angeles and New York to 1/100 of an inch. The speed of rotation of the earth and moon, as well as their axial and orbital variations, can also be determined. McDonald Observatory was the premier LLR station during the 1970s and early 1980s. The 2.7-m system, using a Korad ruby laser, routinely produced normal point data with an accuracy of 10-15 cm. After 15 years of operation the 2.7-m system was replaced by a dedicated 0.76-m system, built around a frequency-doubled Nd:YAG laser that produces LLR data approaching 1 cm normal point accuracy. In the early days one of the biggest challenges was discerning returning photons from "stray" photons. MLRS would fire 1014 or 1015 photons to the moon (Fig. 3) and only about 10 or so returned to the photodetector, so being able to verify them was absolutely essential. "We devised a four-filter system," says Peter Shelus, senior research scientist at UT-Austin's Center for Space Research and member of the MLRS team. "First, we opened the detector to the sky just before we thought the photons were due back-about 2.5 seconds later. Second, we used a pinhole aperture only a few arc seconds in diameter to look at a very small part of the surface of the moon. The third filter was spectral -- we fired red light from the ruby laser or green from neodymium and looked for those wavelengths coming back in. The fourth filter was mathematical to neutralize noise in the photodetector." Increasingly the trend at LLR stations has been toward narrower laser pulses and greater accuracy (Fig. 4). Today satellite laser ranging stations such as RGO (UK) and Graz (Austria) are favoring super-short pulse kiloHertz lasers. 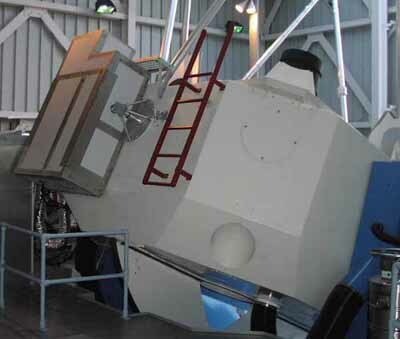 Apache Point Observatory Lunar Laser Ranging Operation (APOLLO), the most advanced LLR station in the world, uses a 3.5-meter telescope and 532 nm Nd:YAG laser (100 ps pulse duration, 115 mJ/pulse, 20 Hz -- Fig. 5). "We routinely achieve 1-mm precision with a 7-picosecond round-trip travel-time error," indicates Tom Murphy, director of APOLLO and associate professor of physics at University of California, San Diego. "Our APD array is a working prototype from MIT's Lincoln Labs in a 4x4 format with 30-µm diameters on 100-µm centers. 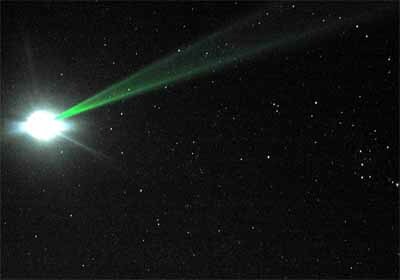 Photon detection efficiency is about 50 percent." "Lunar discoveries using LLR include a fluid core, tides in lunar rock of about 0.1 m amplitude that actually displace the rock surface, and the measurement of various parameters related to the orientation of the moon," says James Williams, a scientist with the Jet Propulsion Laboratory in Pasadena. "We also get the orbit, which includes a tide-caused (mostly tides on earth) increase in distance of 3.8 cm/year." The tidal increase has moved the moon from close to earth early in their history to its present location. The orbit and orientation of the moon are also used to plan modern spacecraft missions to the lunar surface. Lunar laser analysis provides a highly accurate test of the Equivalence Principle, along with several other tests of Einstein's general relativity. The Equivalence Principle predicts that the earth and the moon are falling toward the sun at the same rate, despite their different masses, compositions, and gravitational self-energies. It's possible this theory will eventually be proven invalid in quantum theories of gravity. A time series of highly accurate measurements of the distance between the earth and the moon using LLR can be used to determine if this principle holds true. "LLR results are consistent with the expectations of Einstein's general theory of relativity," says Williams. "It is remarkable that general relativity has survived a century of testing and that the Equivalence Principle is intact after four centuries of scrutiny. However, each new significant improvement in accuracy represents unknown territory, and that's the reason for future testing." Calculations have also shown the universal force of gravity is highly stable. "LLR currently provides our best tests of the time rate of change of Newton's gravitational constant G to less than a part in a trillion per year," says Murphy. LLR applications on earth include monitoring plate tectonic activity, tracking variations in ocean circulation, mean sea level, ice sheet thickness, and wave heights, and calibrating microwave tracking techniques. Lunar laser ranging also pioneered the technology for single photoelectron detection and timing, which is currently used for most satellite ranging. Ultrashort pulse lasers spanning the femtosecond and picosecond regimes are now available. "The kHz stations in Graz and Herstmonceux presently use High-Q Lasers' pico-REGEN system, which produces nominal 10 psec pulses at 2 kHz with single-pulse output energy of about 0.4 mJ," says John Degnan, chief scientist for Sigma Space Corporation. "This performance is achieved by using a mode-locked oscillator (to obtain short but very low energy pulses) and a regenerative amplifier that boosts the energy by many orders of magnitude via a large number of passes through the amplifier before the circulating pulse is switched out." Degnan notes some scientists are requesting higher energies in the few mJ range with these lasers and the company is presently working on two possible solutions: (1) the use of a post-amplifier for the standard Nd:Vanadate system and (2) trying different laser materials, such as Nd:YLF. Which is precisely what Douglas Currie, a professor of physics at University of Maryland-College Park and former investigator at MLRS, is doing. 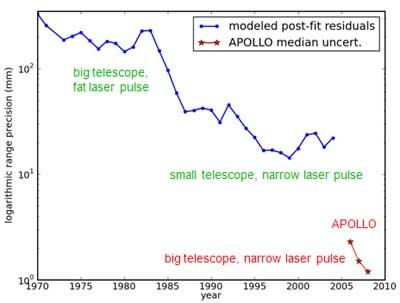 "Lasers with shorter pulse lengths are now available and ground station performance (and software analysis algorithms) has improved by a factor of about 150," he says, "but the limitations in the Apollo retroreflector arrays means there is no significant gain in using them. To correct this I am developing a new design for arrays that will be carried to the moon on the next landings." Currie's research is being supported by NASA and Laboratori Nazionali di Frascati in Rome. The new arrays will support ranging observations that are 100 times more accurate than what the current lunar retroreflector arrays can provide, advancing from centimeter to micron levels of precision. The design will address the thermal and optical effects of absorbing solar radiation and reduce the transfer of heat from the housing to the retroreflector array. U.S. researchers continue to study the possibility of laser transponder missions to Mars, the Martian moon Phobos, or other planets. "Laser ranging over interplanetary distances using two-way laser transponders included two successful experiments in 2005 to the Messenger spacecraft (24 million km) and Mars Global Surveyor Spacecraft (80 million km)," says Degnan. Millimeter accuracy ranging over interplanetary distances can provide orders-of-magnitude-higher precision in the measurement of key elements of general relativity. NASA's Jet Propulsion Laboratory has proposed a three-year mission that would outfit a spaceborne terminal with a telescope (12-cm aperture) and a transmitter (power of 250 mW). The earth terminal would have a 1-m telescope and transmit 3 mJ, 12 psec pulses at kHz rates. "Much of the science that LLR investigates could break down as we push our levels of measurement further," says Murphy. "We are already in the interesting zone of the Equivalence Principle. Where will we find violation, if at all? We can probably go one more order of magnitude -- will that identify a new order of physics? Impossible to say, but right now I wouldn't be surprised to see a significant discovery made at any time." Mark Crawford is a freelance science writer based in Madison, Wisconsin.